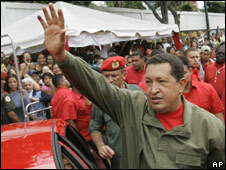 Venezuelan President Hugo Chavez has revoked a law that made sweeping changes to the intelligence services. Mr Chavez said he recognised he had made errors when proclaiming the law by decree, adding that it breached the country's constitution. The law obliged people to co-operate with intelligence agencies. Refusal to reveal information was punishable with up to six years in jail. Human rights groups have said the law threatened civil liberties. Mr Chavez had argued that the new law was needed to protect national security - to prevent opponents of his socialist revolution from destabilising the country and his government. But now in a clear U-turn, Mr Chavez decided to withdraw the law completely. He said that his socialist government would not accept persecution of anyone, announcing that the law would be completely re-worked. Human rights activists, political opponents and the Roman Catholic Church, all expressed concerns about what they saw as a heavy handed, Cuban style attempt to control the population. Cartoonists nicknamed the document the "Getsapo" law. It is a play on the words Gestapo and sapo - which translates literally as frog but more colloquially in Venezuela as snitch.